Clone Tools is the first duplicate file finder for Windows that finds folders with shared or identical content. The program has a unique side-by-side folder explorer that gives you a birds-eye view of your duplicate files and folders. Clone Tools also contains fast and powerful tools to remove duplicate files that lets you delete duplicate files from one or more folders with one click! Redundant copies of files does not only eat hard drive space but also makes your computer disorganized. Download Clone Tools and start organizing your computer and delete duplicate files. 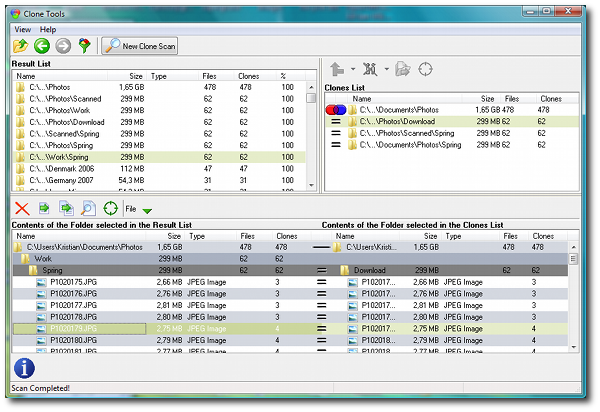 Clone Tools side by side browser and focus on folders containing duplicate files rather than the duplicate files themselves gives you a birds-eye view of your duplicate content. This gives you better control of what what you are doing and enables you to quickly find out which files and folders you want to keep and which you want to delete. No more browsing in lists of thousands of duplicate files or use of rule based duplicate file removers that puts your valuable files at risk. Clone Tools has several simple-to-use automatic functions that lets you clean your hard drive or network from duplicated files and folders in the shortest time possible. Clone Tools uses a byte by byte scan on all duplicate files and folders, this is the only way to know for sure that the files are identical. Windows system folders are excluded from the scan by default. Clone Tools does not allow you to delete the last copy of any file. For more hands on information about how Clone Tools will help you find and delete duplicate files you may want to Watch a demo movie, read our quick tutorial of how to Find duplicate files or Download a free trial version. If you have a problem with many redundant copies of files, cluttering your hard drives or network, Clone Tools is the program for you! When working with images, mp3:s, other documents, making backups, or just accessing the internet it is easy to accumulate a lot of files that are in fact clones, they have the exact same contents. It is not as easy to locate these duplicate files, they may have different names, be located in different folders or on different disks or computers. Clone Tools will find these dupe files for you and gives you excellent tools for managing and removing both duplicate files and folders. Clone Tools performs a byte by byte scan on all duplicate files, this is the only way to be 100% sure that the files are true duplicate files. 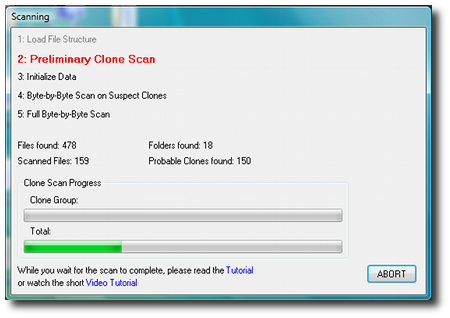 This scan makes Clone Tools safe to use, you can be certain that no files that are not identical will be deleted. 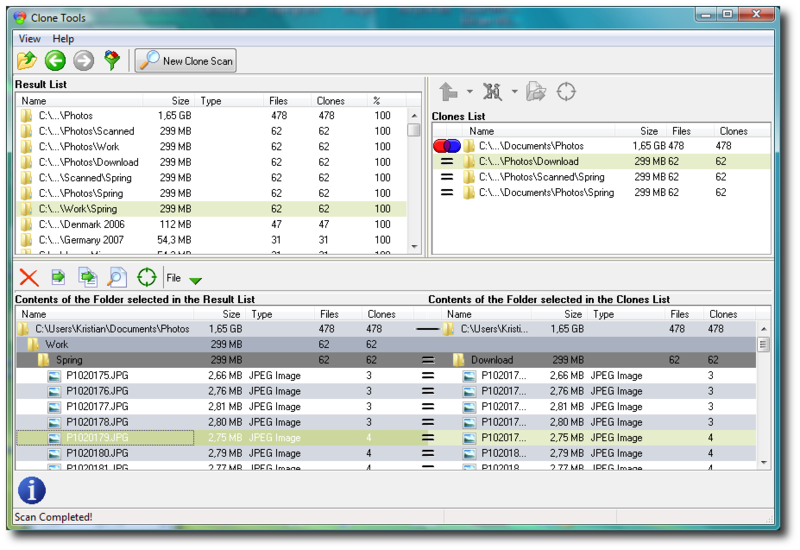 The unique benefit of Clone Tools is that it not only helps you find duplicate files, it also finds folders that contains these duplicate files and compares the folders to each other. The scan result is presented in a twin browser, where you can compare and work with both folders containing identical duplicate files as well as the files. Working with folders containing duplicates instead of individual duplicate files will save you lots of time and trouble. You will always see exactly where each duplicate file is located and Clone Tools powerful duplicate file removal tools enables you to clean your hard drive or network from duplicate content in a fraction of the time it would take with a conventional duplicate file finder. To read more about Clone Tools visit Features.